SQLite transactions are ACID (Atomic, Consistent, Isolated and Durable). This means that data is not lost in the event of crashes, power failures or operating system dumps. Atomic - Meaning changes cannot be broken down into smaller parts; either the entire transaction is commit or nothing at all. Consistent - A transaction must ensure to change the database from one valid state to another. If a transaction results in invalid data, the database will revert its previous state. Isolated - Transactions are isolated from one client to the next. When changes are made to the database the changes are only visible to that client until it is committed. If two people concurrently make changes to a database, they will be transacted sequentially. It does not ensure the order of transactions. Durability - If a transaction is successfully committed, the changes are permanent going forward, if it is interrupted during the commit it will revert to its previous state. SQLite3 uses auto-commit mode by default. HAVING is another filter that checks for presence of the operator. SELECT * FROM database_table is acceptable usage in testing or development but in production the query should be explicit. Used to insert new data be it single row, multiple rows, and default data into tables. 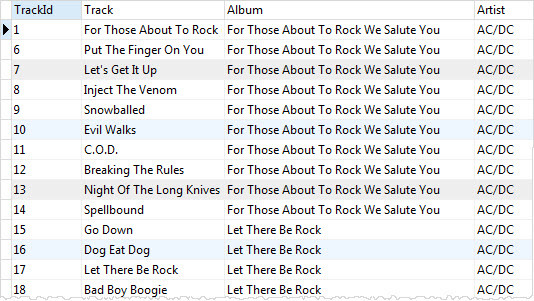 The above example shows how to insert multiple rows into a table. An example of how to insert into column name within table artists. Data can also be inserted via a SELECT statement. Update already existing data in a table. the UPDATE clause informs SQL that some part of the table is going to be amended. the SET clause signifies and allows the updating of the column/s that precede it. On the left of the assignment operator (=) is the column to be updated and on the right the new value, expression or data. Whilst the WHERE operator is optional if it is omitted all rows will be updated. The delete statement allows for deletion of one, multiple or all rows within a table. Like updating a table, WHERE, ORDER BY and LIMIT clauses can be applied to a delete operation. In addition deletes can be orchestrated through the SELECT operator. In relation databases, data is often distributed amongst many related tables. Foreign Keys are used to associate these tables. INNER JOIN clause will combine columns from correlated tables. In fig 1.1 Table A’s ‘f’ column is compared with table B’s ‘f’ column. If the value of the ‘f’ column in the A table equals that of B’s ‘f’ column it will return the match. More simply, INNER JOIN clauses return rows from table A that have corresponding rows in the B table. INNER JOIN may connect more than two tables. This will require two inner join clauses form the SELECT statement. Fig. 1.2 is the result set of the above query. Theoretically, the result of a Right Join and Left Join with NULL values for every column of the table that does not have a matching row. This is technically not available in SQLite3, however they do offer a workaround. Given that SQLite3 does not have RIGHT JOIN or FULL OUTER JOIN it uses both UNION and LEFT JOIN to emulate it. It achieves this by switching the position of the LEFT JOIN clause over both columns. SQLite also uses UNION ALL to duplicate rows from the result set of both queries. Finally, the use of a WHERE clause will remove rows already included in the result set of the first SELECT statement. See the below code for an example. In order to qualify as a relational table, it must have a primary key. 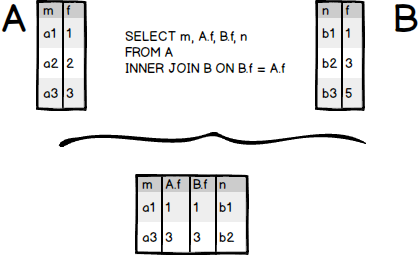 The primary key consists of one or more columns whose data contained within is used to uniquely identify each row in the table. metaphor If rows were mailboxes the primary key would be the street address. 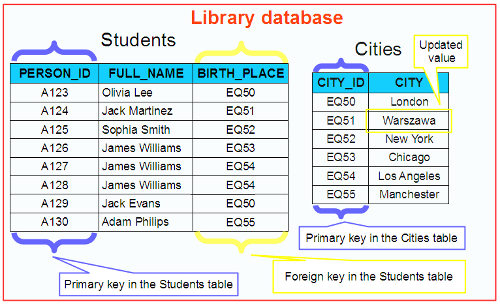 Tables must have primary keys, and these are stored in an index which is used to enforce the uniqueness requirement. Being indexed, accessing it does not necessitate scanning the entire table. A foreign key is one or more columns in a table that refers to the primary key or unique identifier in another table. They unlike primary keys can contain NULL, blank or duplicate values. As they allow duplication it is best not to use a foreign key as a primary key, unless it is a one-to-one relationship. In the above picture we have a Students and Cities table. PERSON_ID and CITY_ID are unique, and therefore make good Primary keys (which they are). Inside the Students table it is possible for several students to be born in the same city. As such the BIRTH_PLACE column is the foreign key to the Cities table. This ensures that there is relationship between the tables and that relation points to something unique in the other table. BLUF: combines result set of two or more queries into a single result set. The ORDER BY is applied to the combined result set, not the individual result sets. The basis of all interactions with the database. Inserts, updates, deletes, commits and table creation and deletion are all transactions.